I was out of the country last week without cell service, and upon landing in the U.S. at 9:00 pm last night, I had two voicemails and a text from staff at the Bureau of Land Management (BLM) Delta Corrals asking me to call them. This is not out of the ordinary, I figured they were calling to talk about finalizing the adoption of Antonino's herd mate, but when I noticed the text was sent Saturday night, my heart sunk a little. He told me the vet came out to do geldings on July 28th and gave Antonino anesthetic. He lay down and went to sleep. He never woke up. My mind began to race...all of the other mustangs: Carlitos, Maximus, Enrique, his herd mates, they were as old as Antonino, but they didn't have any complications. How could this be? Then, my mind and body went numb, I couldn't breathe, so I sat quietly at the airport and listened. He told me the BLM management wanted to make a statement about Antonino's death, but Delta had asked them to wait until they could tell me; they didn't want me to hear about it from the media. He told me how upset they were at Delta and they knew it was going to be devastating news. I thanked him for their compassion. He told me that the BLM statement will be released on Monday. Please know, I have no idea what it will say. The vet report said they didn't proceed with gelding; that Antonino died from possible cardiac arrest from the anesthesia. This is the "medical" reason. I know this is a lot to digest, but I wanted to let you all know personally, as the BLM Delta did for me. We all fought so hard for him, and prayed for him. I'm so sorry I will not be picking Antonino up the last week of August. I'm so sorry, he will not be meeting his family at the sanctuary. I'm so sorry, we will not see him running free again on this Earth. I do pray we will see him running free in our dreams. At this point, I must try to lift my heavy heart as I remember his herd mate is waiting. And, I ask you to do the same. There is an empty spot on the trailer now. Another Sulphur herd mate still waiting in holding can take his spot, but we know he will never fill the void. 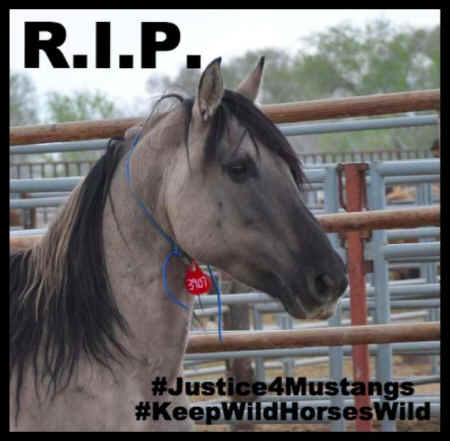 As we grieve together, I ask you the favor of three requests: 1) May we join together to get his last two family members to the sanctuary and do our best to focus on the fact that by the end of August, we will have rescued and reunited 11 Sulphur mustangs who will be free to run; 2) May we stand together to keep wild mustangs in the wild so we don't not have to experience this tragedy again; and 3) May we represent the majesty of Antonino by acting with dignity in our action and words. We will continue your fight to save your family." It's the least we can do for him. Thank you, mustang warriors, for all of your never-ending support. Thank you to Black Hills Wild Horse Sanctuary for giving Antonino's family a home. Thank you to AWHPC for their support. I'll be in touch soon about his last two family members. May Freedom Reign for all mustangs everywhere, including those wild spirits running free in the Heavens.